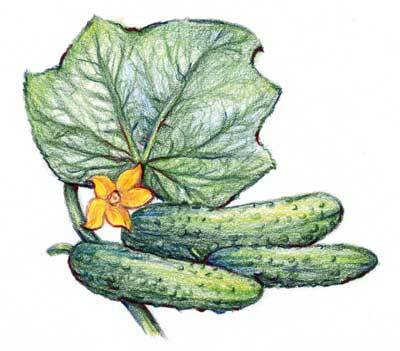 How to Grow: Cucumbers require a rich, well-drained soil in pH range 7-7. Avoid too much nitrogen or fruits may be bitter. Water plants regularly to get the mildest fruits. Seeds require a temperature of at least 68 degrees F to germinate. Plant out starting 1-2 weeks after last frost. Seed Watering Notes: Be careful not to overwater germinating seeds or they may rot. It's best to soak the ground or the potting soil heavily when first planting, then avoid watering again if possible until seedlings emerge. (For seeds in potting soil, keep them warm but out of direct sunlight so that they don't dry out so fast.) Cucumber seeds emerge in 5+ days; very lightly water ground or potting soil around day 3 or 4 to keep soil from crusting so that seeds can emerge more easily. Direct Seeding: Sow seeds 1/2 to 3/4 in. deep. Final spacing should be 6-12 in. apart in rows 3-5 ft. apart. Transplants: Sow seeds 1/2 in. deep, 2-3 seeds per pot. Cut off weak seedlings at the base to avoid disturbing roots. Seeds germinate best at 85-90 degrees F (29-32 degrees C). Maintain seedlings at 75 degrees F or higher. Harden plants before setting out, and take care not to disturb fragile roots when transplanting. Since cucumber transplants are fussy, hold back a few seedlings for filling in any gaps in the row as they appear. Harvest: To maintain good production, harvest fruit every 1-3 days. Greenhouse Notes: Grow cucumbers on a trellis to make use of vertical space. Use mildew-resistant varieties, and hand-pollinate. Diseases: Although scab is not usually a problem in the Mid-Atlantic region, two fungus diseases, powdery mildew and downy mildew, are common. Powdery mildew occurs during hot, dry spells, whereas downy mildew occurs during wet, cool spells near the end of the growing season. Mosaic virus causes a yellow and green mottling of the leaves and reduces plant vigor. Anthracnose, a fungus disease, is most common during mid- and late- season and during dry weather. Dark brown spots on the leaves and round sunken spots on the fruit are evidence of Anthracnose. Another fungus, angular leaf spot, is common during cool, wet weather. Symptoms of angular leaf spot include interveinal browning and small circular spots on the fruit. Bacterial wilt causes sudden dramatic wilting and death of the vines. Use resistant or tolerant varieties, practice good sanitation and crop rotation, and pay attention to proper growth requirements. Insect Pests: Early season cucumber beetles can kill young seedlings. For about a month starting ~2-3 weeks after last spring frost, cucumber beetles are much hungrier than usual, and will kill young seedlings. During this time, dust young seedlings with pyrethrins or rotenone, or cover with row cover until the feeding frenzy has passed. Cucumber beetles can also spread bacterial wilt. Control cucumber beetles with chickens and an Amaranth trap crop. Seed Savers: Isolate varieties by 1/8 mile for home use. Isolate a minimum of 1/4 to 1 mile for pure seed. Packet: 2g unless stated (about 59-78 seeds, depending on variety) sows 20'. Known disease or pest tolerance is indicated in brackets after the variety name. Since many factors affect disease and pest tolerance, results may vary from region to region. Resistance to specific insects is only partial.